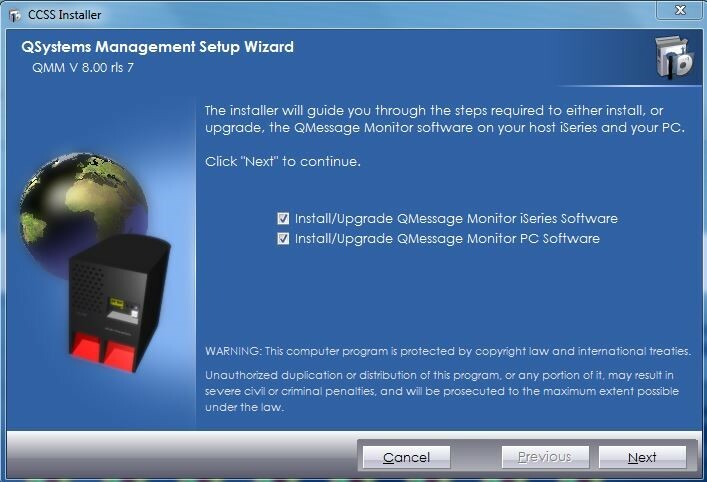 Upon download of the software, use the following instructions to install the QMessage Monitor on your IBM i (i5/OS) running on IBM Power Systems (System i, iSeries). Only experienced system operators or technical support staff should perform the installation. 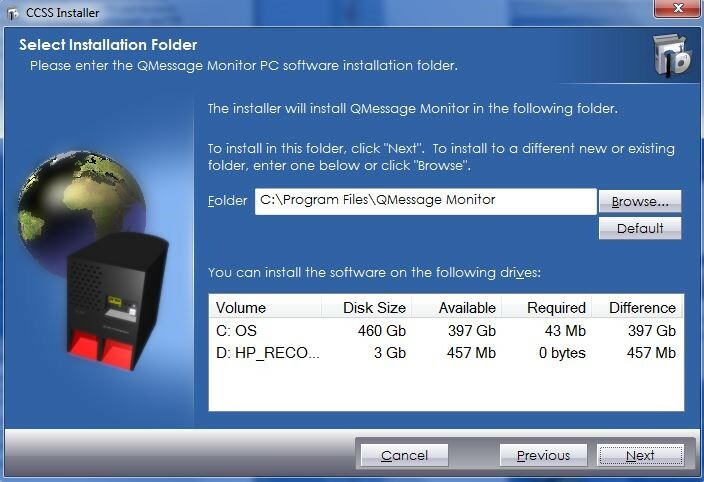 Check general information and the system requirements for QMessage Monitor in "Before You Install or Upgrade Your CCSS Products" on our website. Be sure any required PTFs have been installed on all IBM i systems on which the software is to be installed. For a list, see "QMessage Monitor PTF Requirements" on our website. For installation, QSECOFR (or a user profile with the same special authorities as QSECOFR) is required on the host system. The user profile must have Limited capabilities set to *NO and have authority to execute CL commands via FTP. Do not attempt to install this product without the required authority. QSECOFR authority can be obtained from your security officer. On systems where English is not the primary language used by the operating system (OS) and where multiple languages are installed, the secondary language support for the OS needs to be at the same level as the OS. 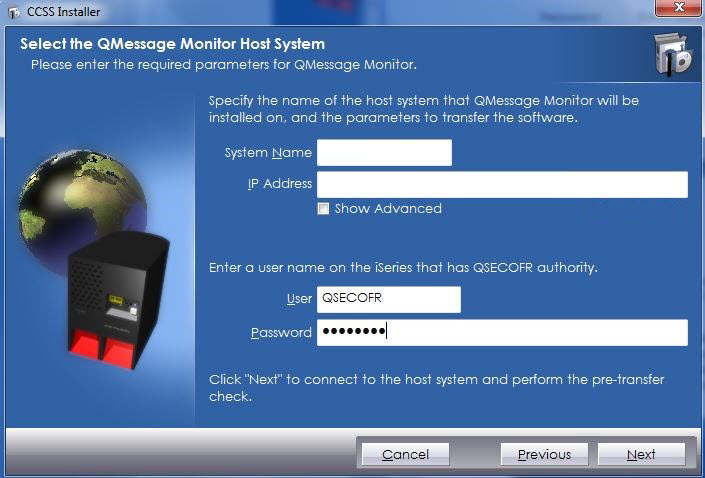 The Work-with-Job functionality in the QMessage Monitor PC Console requires IBM Client Access/iSeries Access/System i Access to be installed on the PC. For the installation of the PC software, a user account that is a member of the Administrators group is required. During installation, both the server (IBM i) and the client (PC) software are loaded in the same session. Double-click the downloaded installation program. The installation starts automatically. Select the options for the installations you want to perform. You can install both the server (IBM i) and the client (PC) software in the same session, or install only one of them. Click Next. If you chose to install the PC software in step 2, enter the directory where the software will be installed. Click Browse to select a different directory. After you've selected a directory, click Next. Enter the name and communication information for the host IBM i system (details follow the image). System Name Enter the name of the host system where the software is to be loaded. IP Address Enter the TCP/IP address or DNS name to communicate with the host system. If possible, the installer will automatically determine the fully qualified host name from the entered System Name. Show Advanced Select Show Advanced to change the port number of the FTP service and QMessage Monitor. This is normally port 21 and 3070. User Enter an existing IBM i profile. Be sure it has the correct authority to install or upgrade the product. Password Enter the password associated with the above user. Click Next. The installer determines whether or not a version of the software already exists on the host IBM i system. Since this is a first-time installation, enter the parameters (described below). Click Next. User Profile Enter a name for a new IBM i user profile to be used to run the monitor (default value is MM). This user profile will be created during installation. Password Enter the password for the user profile specified above (default value is MM). Note: This field is protected, but requires an entry. 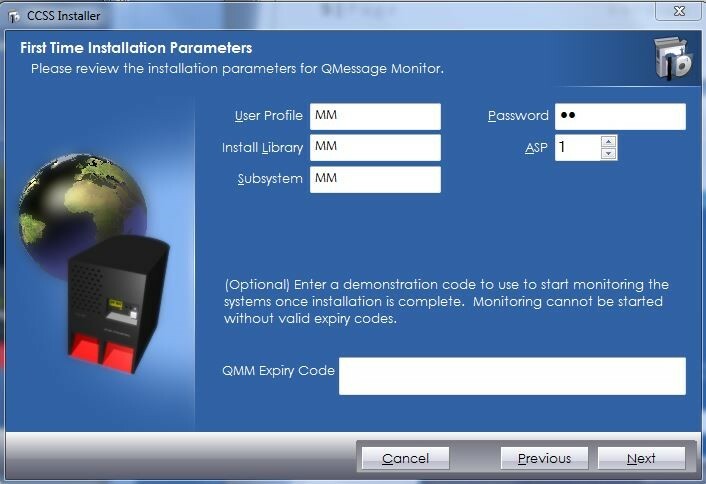 Install Library Enter the name of the library in which QMessage Monitor will be stored (default value is MM). The library will be created if it doesn't already exist. ASP Enter the auxiliary storage pool in which the library is created (default value is 1). 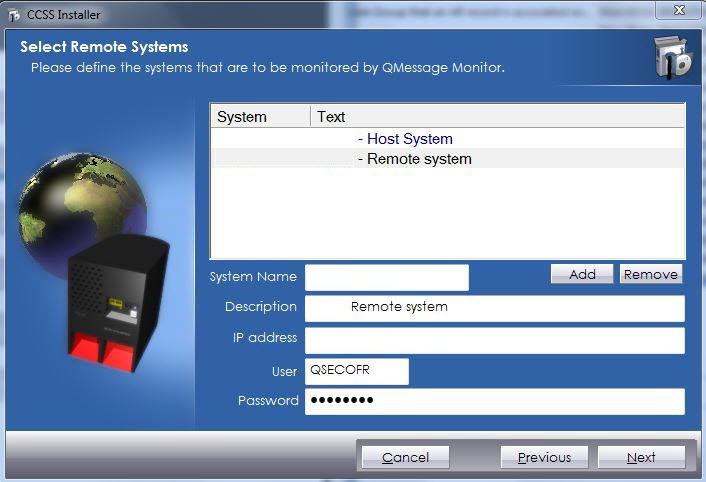 Subsystem Enter the name of the subsystem in which the QMessage Monitor jobs will be active (default value is MM). QMM Expiry Code Enter the temporary license key that was supplied to you. From the next screen, you can add or remove remote systems from the configuration. To remove a remote server, select the server and click Remove. System Name Enter the name of the remote system on which the software will be initially loaded. The name can be determined from the network attribute using the command DSPNETA. Description Enter text that describes the remote system. IP Address Enter the TCP/IP address or DNS name to communicate with the remote system from the host system. User Enter an existing IBM i user profile. Be sure it has the correct authority to install or upgrade the product. This user profile is only used to install the product. When it's started, it runs under the user profile as defined in step 6 above (First Time Installation Parameters). After all the remote systems have been entered, click Next. The installer transfers the IBM i installer to the host system and then continues to restore the objects into the selected library. 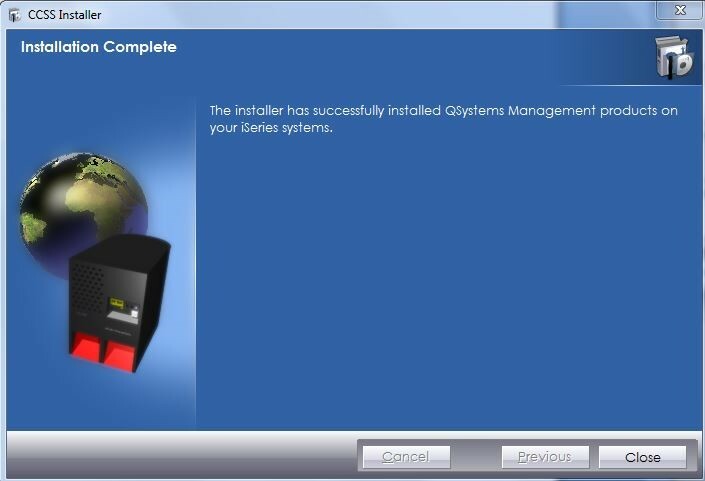 Messages from the IBM i installer are displayed on the screen. When the transfer is complete, the latest versions of the objects are installed to the QMM destination library. The PC GUI software, if selected, is installed on the PC. When you see the Installation Complete screen, click Close. After installation, use the Registry Editor to give the user group Users the Full Control permission to registry key \\HKEY_LOCAL_MACHINE\SOFTWARE\CCSS. When any of the PC modules are started for the first time, one or multiple error messages may be displayed that refer to problems accessing folders. These are not displayed on subsequent use of the PC modules, as the software will then use alternative file locations. When defining the connection to the host in the PC software, make sure the PC Name that is set is unique for each Windows user account for which you define the connection. Reusing the same PC Name for multiple users causes the connections between the PC software and the host to fail. When publishing QMessage Monitor as an application, do not make it accessible to Anonymous users.